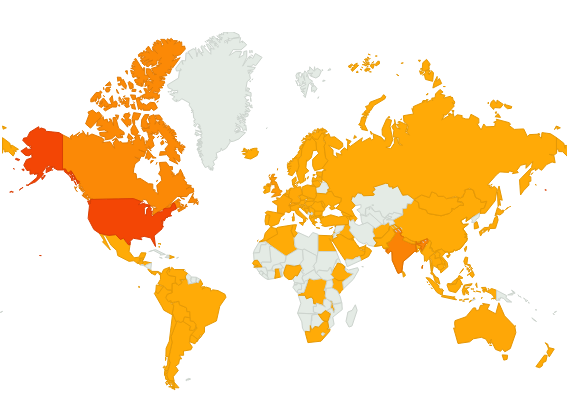 We are thrilled to let you know that Lhakar Diaries has now reached over 125 countries around the world! People in the United States, Canada and India are our strongest base, but we also have visitors from places such as Ethiopia, Peru, Slovania and even Iraq. Needless to say, when we started this blog just over a year ago, we never expected to reach so many people. And the fact that people in the most remote parts of the world are reading our words is beyond surprising. We’re just a bunch of young Tibetans writing whatever we feel is important to us. We are humbled and we want to thank you for reading our posts. We also want to hear from you! How do you feel about Lhakar Diaries? What you like? What don’t you like? What would you like to see? Who are you? How are you so cool? All the shaded regions are countries that have visited LD. The color also varies (darker for more visitor) on the number of visitors to the blog. Please take 5 seconds to fill out the super quick questionnaire below so we can get a sense of who’s reading our blog! It’s so important to us! Now, in your own words, please tell us below (1) why you visit Lhakar Diaries and (2) what you would like to see new or more of on Lhakar Diaries. If you like, you can post your suggestions in the comments section below instead. Your feedback is so valuable to us. Thank you for taking the time to do this!